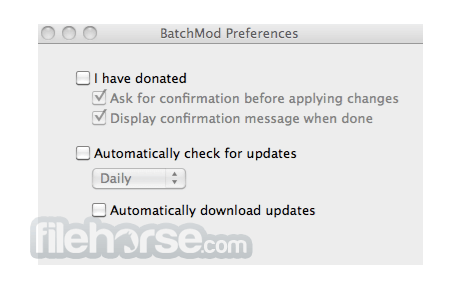 BatChmod for Mac is a utility for manipulating file and folder privileges in Mac OS X. It allows the manipulation of ownership as well as the privileges associated to the Owner, Group or others. It can also unlock files in order to apply those privileges and finally, it can remove any ACLs added to a folder or file under Mac OS X 10.5 Leopard or better. 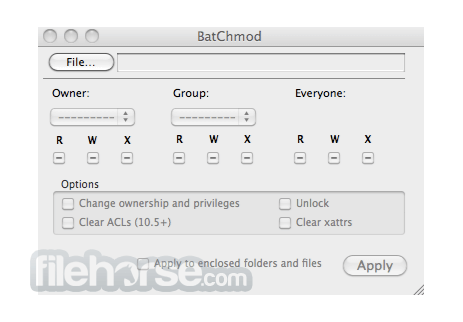 BatChmod can also give you back access to locked files, folders or disks. If something is locked, it can unlock it. If you no longer have permissions to files or folders, change the permissions back. Sometimes, a whole hard disk can become inaccessible or locked and often, BatChmod can unlock those too!